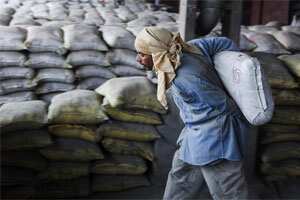 UltraTech Cement Ltd’s business is getting affected by the economic slowdown, which is crimping demand for cement, as well as by the rising input costs. The September quarter is traditionally a weak one because construction activity slows during monsoon. Still, a year-on-year (y-o-y) comparison should provide a true picture, adjusting for the fact that the monsoon was quite active this year. UltraTech’s cement and clinker sales rose by just 1.1% y-o-y in volume terms, but per unit realizations rose smartly, by 20.3%. In the year-ago quarter, realizations had got affected because of lower demand and excess capacity. Subsequently, prices improved. Sales rose by 22% y-o-y to ₹ 3,909.80 crore, while operating profit jumped by 49% and net profit rose by 141% to ₹ 279 crore. Net profit growth was helped by lower growth in interest costs and lower tax. A look at sequential growth shows falling margins, which is a concern. One reason is a 6% decline in per unit realizations, and the other is higher costs. Note that the monsoon season usually sees prices weaken due to slower offtake. But the real worry is on the cost front. Despite a 10% decline in sales, operating costs went up by 4.7%. Rising energy, coal and freight rates are affecting costs, the firm said. Operating profit margin rose 290 basis points y-o-y, but fell 11.5 percentage points quarter-on-quarter. One basis point is one-hundredth of a percentage point. Unless cement prices rise from their levels in the September quarter, the pressure on margins is likely to continue. The low base effect will taper off in the December quarter, which will lead to much slower reported sales and profit growth than was visible in the current quarter. Many of these factors are already known to investors; perhaps, explaining why the stock fell only 1% despite the management’s pessimistic outlook. Investors will look for signs of improvement in construction activity that could lead to higher demand for cement, and trends in cement prices. While excess capacity is a negative factor, firms could limit supply to negate the effect of slower demand and higher costs. That could prop up prices, which are key to a cement firm’s profit growth. Even a small uptick in prices could go a long way in negating the effect of rising operational costs.